On our drive home from church on Sunday afternoons, my mom and I usually like to discuss the day's sermon. This Sunday, being the Sunday of Expulsion we were talking about obedience to God, the shortcomings of humanity, and then, out of the blue, my mom says, "You know...there's one Bible story that I just don't like! It's the story of the two sisters, Mary and Martha." So I asked her what it was that didn't sit right with her. 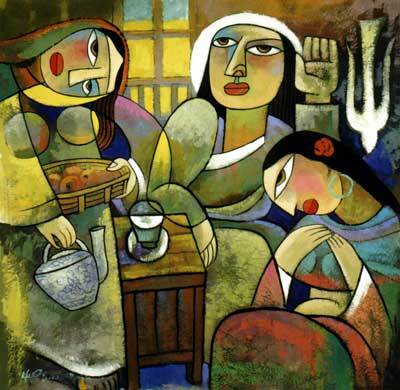 So she told me the story: Jesus was good friends with Lazarus and his two sisters, Mary and Martha. The story goes that Jesus was invited to dinner, and Martha tended to all the house prep, cooking and cleaning and serving her guest, while Mary sat at Christ's feet and listened to His teachings. When Martha had had just about enough of being the only one working, she asks Jesus if it's right that Mary is just kicking back while she's slaving away over a hot stove, and Jesus gives Martha a kind little reprimand saying that her sister has the right idea. Okay, this is the simplified "mom" version...but it's on the money. And mom continued, "I don't like it because Martha is working so hard. I'm like Martha. If Jesus were coming to my home, of course I would want the BEST that I have to offer for Him. I would want to put out the best food, and make sure my house was clean. I'd want to make sure that he was offered food and drink. And I'd want him to feel at home. So poor Martha is doing all of this and her sister is just sitting there! Of course Martha would be upset. I would be upset too. That's why I don't get this story. Didn't Jesus see that Martha was doing all of that for Him? Why did Jesus take sides with Mary?" We did talk about the obvious answer...that Christ wants us to listen to Him, to spend time with Him. The rest of the hoopla is not important. But we arrived home, and then there was lunch to fix, so the discussion got cut short. But I have been thinking about this for two days now and came to the conclusion that there were two issues at hand. The first is "Priorities". It's not so much that Mary was spending time with Christ - that's a given. But it's more about the fact that Mary put Christ first above everything else. Mary understood that once Jesus came to their home, she would put aside everything else and make Christ her priority because nothing else could be as important as being "present" in Christ.. I mean, when would she ever have that opportunity again? And because of that, would she want to sit and absorb everything she could about Him? or would she want to be dishing up pilav in the kitchen? On the other hand, that part is important too. It's just not AS important. So I was thinking of these priorities during my morning prayer. I like to pray first thing in the morning, at about 5:00 a.m. I love this special time alone in the morning, and my intention is good - to set aside quality time with God - BUT my life is hectic. Inevitably during my prayer time, as I'm trying to purge my mind and focus on prayer, the Martha in me makes an appearance and allows my day-to-day to creep in. Then Mary corrals my thoughts back to prayer. Then Martha reminds me of all I have to do, then Mary takes the reins, well, you get the idea. I'm going to have to work on that. Focus and prioritization! And then the second fault of Martha was that she allowed what started off as her JOY - to offer her hospitality to Christ - to become a negative. Her goal was to do something wonderful to show her love for Jesus. But she allowed anger, resentment, and jealousy toward her sister to creep in. She was probably feeling like she wanted Jesus' praise for all the trouble she was going through for Him. Instead Mary was the shining star of the day. I can totally understand how she felt. And the Bible doesn't mention how Martha's comments probably hurt Mary and caused her embarrassment . Negativity breeds negativity. Sometimes, it's the very thing that we're most passionate about that can frustrate us the most. Only because we have a vision of how we want things to be. And there's a healthy dose of pride - okay, an unhealthy dose - attached as well as we embark on the path to making things "just so." But we are not perfect. It's better to let things go that we are not in control of. We can't control what someone else does. We can't control the Mary. Mary is just fine the way she is. All we can do, is control the Martha. Try our best to do our best, but in all things to act out of extreme love. During this Lenten season, I'm going to try to control my inner Martha, and set my priorities on living a Christ-centered life more like Mary. With only four weeks to go, I have my work cut out for me. very nice.. I love this story and your analysis.. I love this.. beautiful story and analysis.. Very nice.. I love your analysis.. The inner martha is a good person, but she is associated with ego, which is always seeking approval and reward for everything she does.. I know we talked about this on the phone a bit already, but it was still a fun read. I especially like this part that you wrote, because it's to true: "Negativity breeds negativity. Sometimes, it's the very thing that we're most passionate about that can frustrate us the most. Only because we have a vision of how we want things to be." Ever since I was in grammar school I've always felt bad for Martha but never thought that maybe she should could have slowed down a bit and maybe she should have asked for help from Mary.